Yeah. It’s true. Towels are the easiest way to decorate a bathroom. 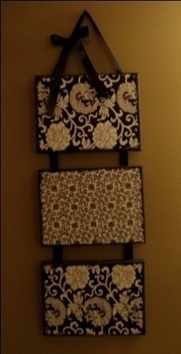 Just tie them up cute on a towel rack, use some ribbons or flowers to keep them in place. It’s WAY cute. Only the husband doesn’t understand that. So, I’ve been banned from decorative towels in the bathroom. I just took a big piece of scrap wood I found in the garage and cut it into 7×11 squares (I guess technically that’s a rectangle). I painted the sides and back black and then Mod Podged my paper on top. Then I hooked it all together with ribbon and voila! A bathroom masterpiece! Looking for a way to keep your closet organized? I’ve got just the project. And yes…it uses Mod Podge!